Photographer: Phil Poynter. Model(s): Aamito Lagum, Anna Ewers, Grace Bol, Pooja Mor, Sara Sampaio, Stella Maxwell. Source: Love Magazine. Stylist: David Casavant. Makeup: Diane Kendal. Hair: Ben Skervin. Anna Ewers, Grace Bol, Aamito Lagum, Pooja Mor, Sara Sampaio & Stella Maxwell celebrate the luscious side of life in “Lick It!” by Phil Poynter for Love Magazine #16, Fall/Winter 2016-17. Beauty goes face first with pictures that project the art of Summer skin. Creativity gets up-close and personal with poetic imagery that punctuates a “Sense” of excitement, as Diane Kendal captures consumption couture with foods that bring the fusion of flavor forward. Anna invites us inside with a cherry clenched between her teeth, as golden gloss flows over a sumptuous, peach pout. A strawberry drips in sweet honey, letting luscious lips part in sensual anticipation. Sipping champagne straight from a straw, black lipstick shines as taste buds tingle. 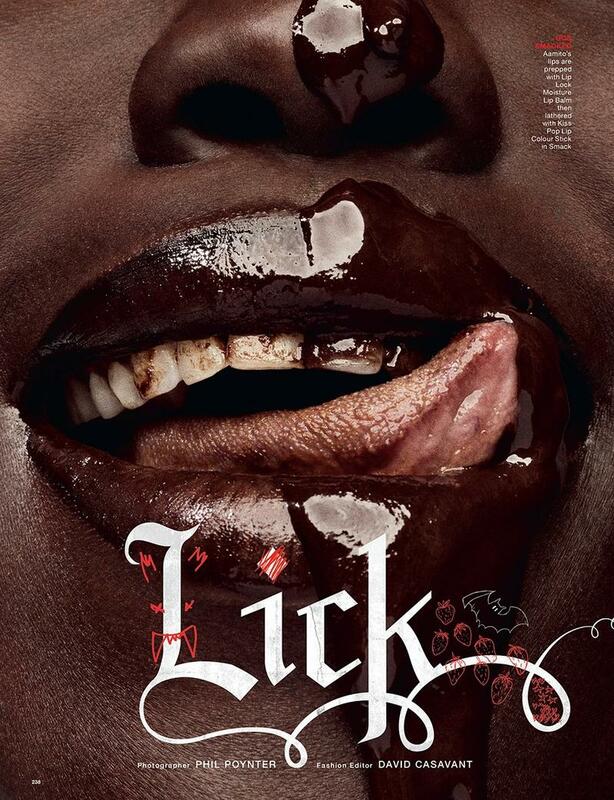 Grace Bol basks in the glory of gorgeous, as the tongue takes its rightful place as, The Taste Maker. Making meals seal the deal. The mouth moves as each close-up captures the sensual nature of eating. Ravenous in her approach, she voraciously attacks each finger, enjoying every last lick. Stella Maxwell lets ice cream melt over her body as chocolate pours erotically over her taut skin. Colors unite as pink, yellow, red, black & tan ignite. Bubbles burst over the top, as Champagne slowly flows down the side of the bottle. Pop-Art plays the parts, from a firm, ripe banana tempting us with desire, to an ice cream sandwich melting over Maxwell’s fingers. Sara Sampaio and Pooja Mor, take things one step further by connecting under the same chocolate waterfall, where the tip of their lips lightly touch. To incite naturally occurring phenomenon into artful revelation, that is the definition of Sense Expression.